« October 8, 2018 Thanks for Listening…I Needed That….And Greatly Appreciate It! Desert Canyon Farm is a registered Wildlife Habitat and is part of the Colorado Division of Wildlife’s Watchable Wildlife and Birding Trail, so needless to say we welcome wildlife of all kinds here and we do our best to co-exist in a peaceable way even when there are challenges. 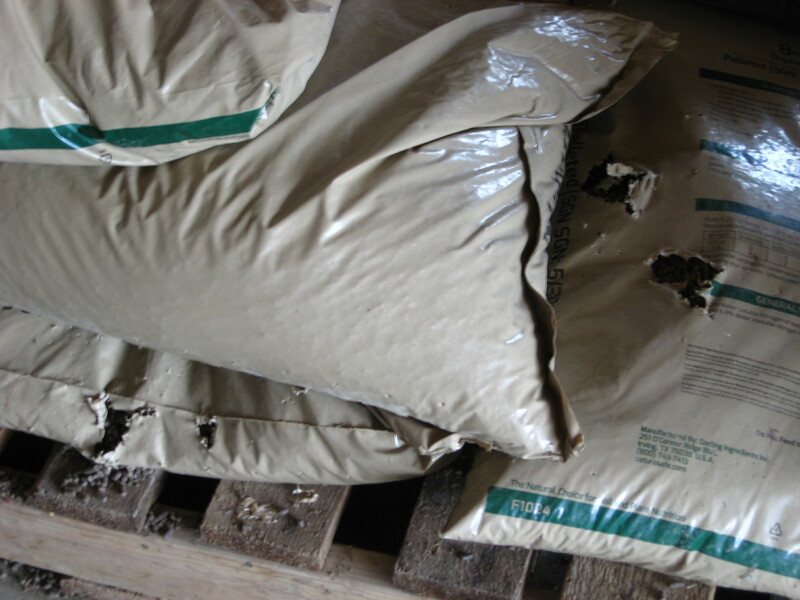 Last week I discovered that Chris had forgotten to close the garage door the night before and a whily raccoon went into the garage that night and thought it had found a delicious feast in our bags of greenhouse fertilizer. Oh my goodness! The fault was ours for forgetting to close the garage door that night, but all the same I was pretty distressed to see that this critter had chewed holes in every single bag of fertilizer we had. There was fertilizer scattered all over the garage floor, which Chris cleaned up while I figured out a way to remedy this raccoon challenge from happening again. And while we’re on the topic of wildlife, we have a rock squirrel that lives in the middle of the desert garden and has been there for the past 2 years or so. This little fur-ball is pretty cute and really fun to watch as he/she moves around the farm collecting seeds and fruits and other tidbits to eat and store for winter. Below is either the front door ( I think so, because this is where I see the squirrel entering and exiting all the time) or the back door to its burrow. 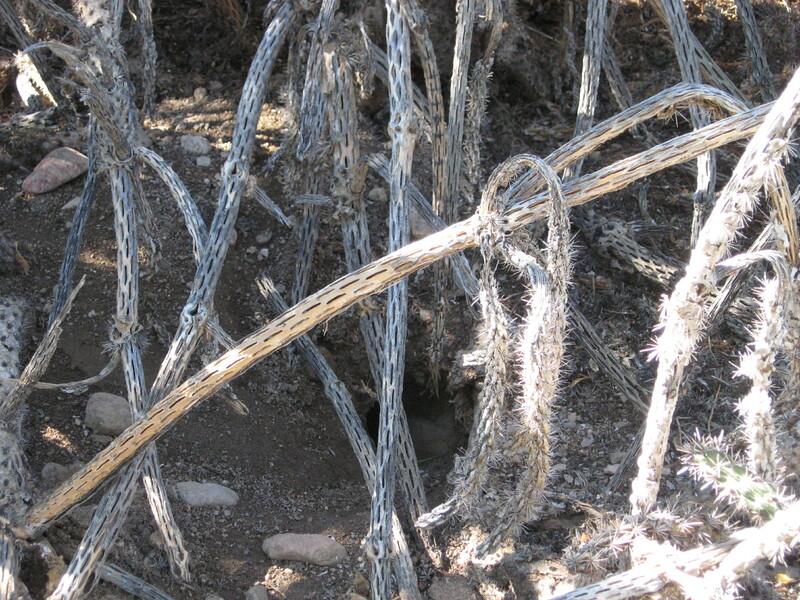 The hole goes deep under the roots of an old cholla cactus. 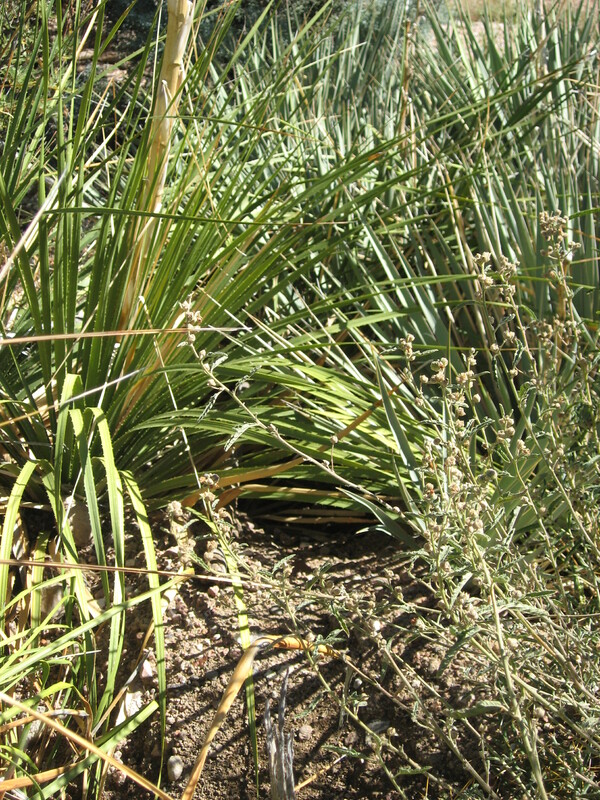 On the other side of the garden is the “back” door (or maybe it is the front door) and it comes out in the middle of a big patch of yucca plants. One year we had rock squirrels get under our house and they started renovating our crawl space and the heating duct system of our house. We did have to get them out of that space and Chris cemented their doors so that they wouldn’t get back under our house to live. That was about 8 or 9 years ago and thankfully they haven’t gotten back under the house again. They do live in one of our equipment sheds, the desert garden and around a pair of old cisterns that no longer function, but all of those places are fine and they haven’t caused us any trouble so they are most welcome. The squirrels, cottontail rabbits, and mice are all part of the food supply for predators like foxes, coyotes, hawks and bobcats, and these predators keep those other critter populations from becoming too big while getting a meal for themselves. All things in balance, and we are all part of the food chain at some point, so it is a good way to think about nature like this. Everything contributes to everything else on this Earth. As I was filling the bird baths this morning, the honeybees were happy to get a drink for themselves too. 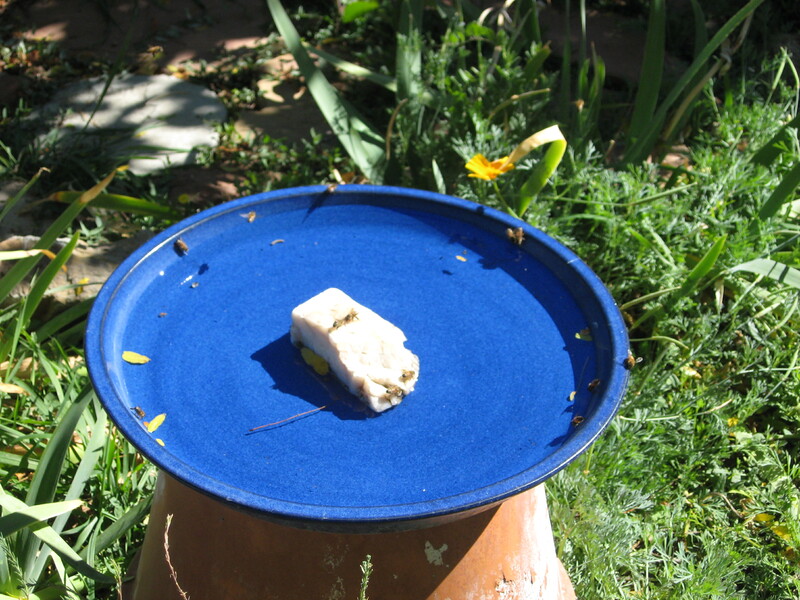 Shallow bird baths provide water for many different kinds of wildlife including pollinators. 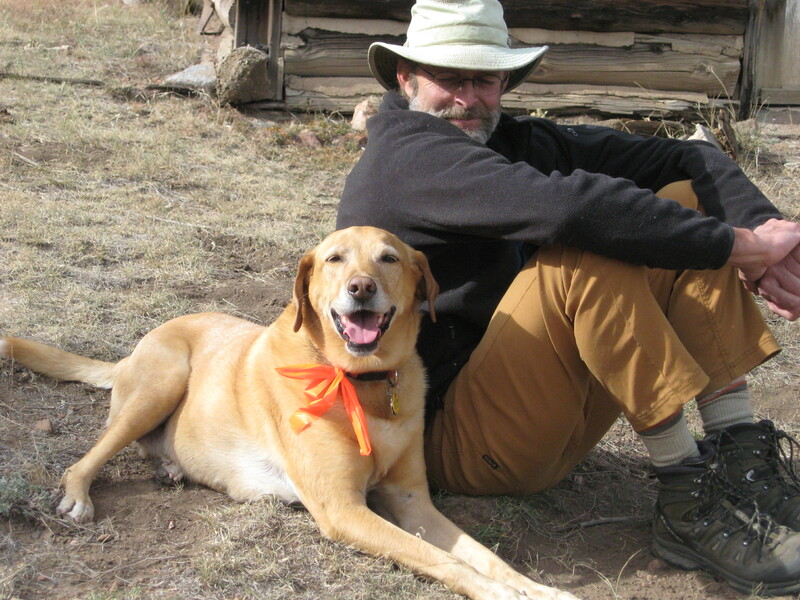 Last weekend, we took a short hike to the Cowboy Cabin, an old homestead cabin not too far from the farm. It is a beautiful hike, especially during the autumn season. Shrek did a bit of wildlife management of his own on that hike. He is forever finding bones and he is very serious about his work of finding the perfect place to bury them. 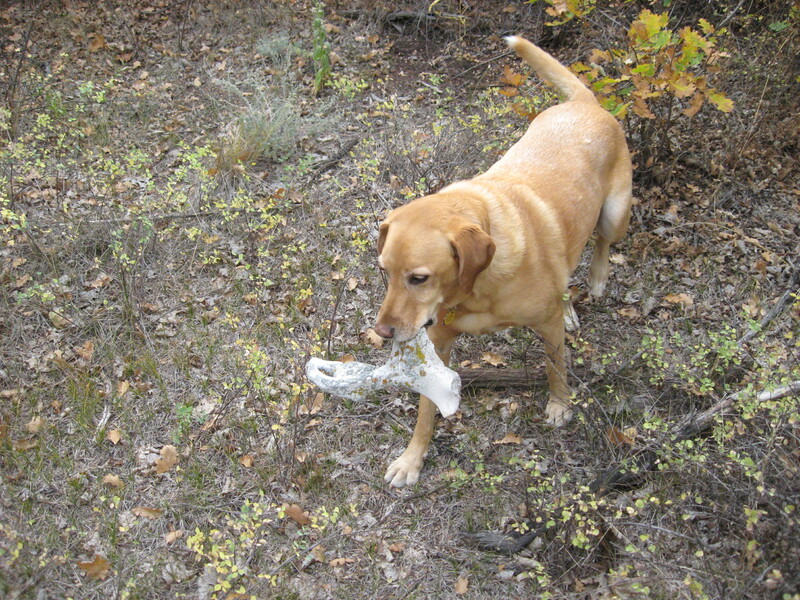 On this hike, he found a rather large bone and set about finding a good spot with soft moist soil to bury the bone. On another subject, we are expecting an early taste of winter here tonight and for the next couple of days. The low temperature tonight is supposed to be in the mid-20’s F, and Sunday night they tell us it will be 14 F degrees. Tomorrow during the day it is supposed to warm up to only the high-20’sF, and Monday a bit warmer, but not by a lot. So, we have been spending today preparing for this cold spell. 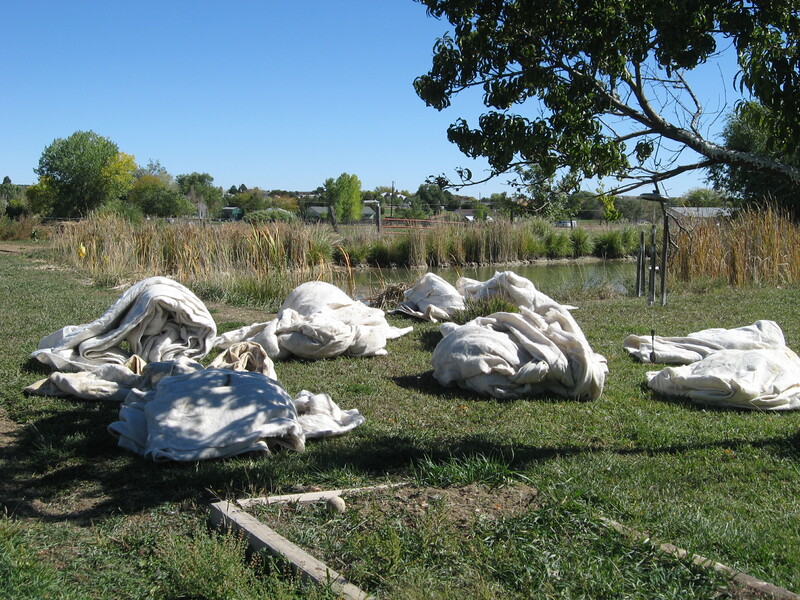 Below are great huge rolls of plant frost blanket that Chris and I will use this afternoon to cover the seed crops that are not yet ripe enough to harvest. There are a lot of these crops not yet ripe, so a large portion of our flower seed crop field will be covered in frost blankets for the next couple of days until the temperatures warm back up enough and then we will have to uncover the flowers so that they can finish ripening to seed before we pick the seed harvest. I’ve also been preparing the retail nursery yard so that I can winter store shrubs and trees outdoors under frost blanket for the winter months. 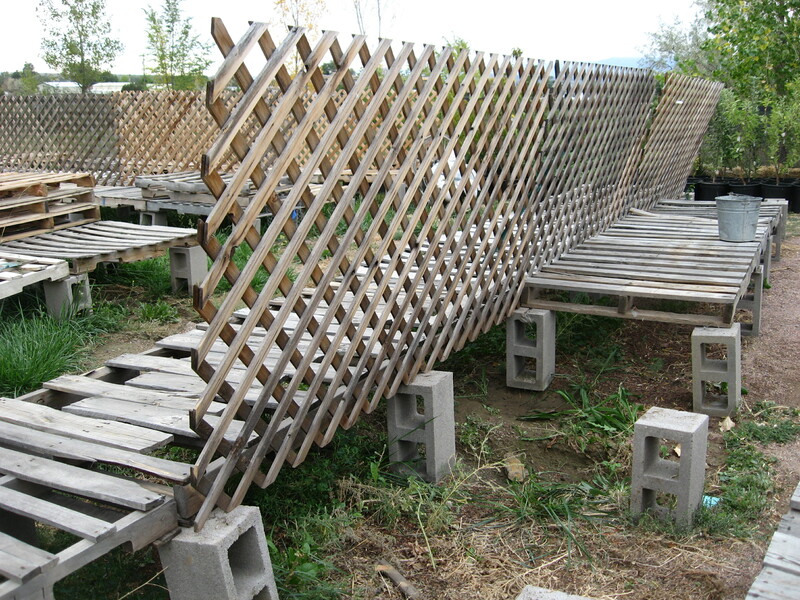 In preparation for doing that, I had to dis-assemble our retail benches and plant sign lattice boards, and stack them all up so that I have a big open area to put the shrubs and trees. I wanted them in a good spot that is protected a bit and also easy for me to water them every couple of weeks as needed during the cold months. 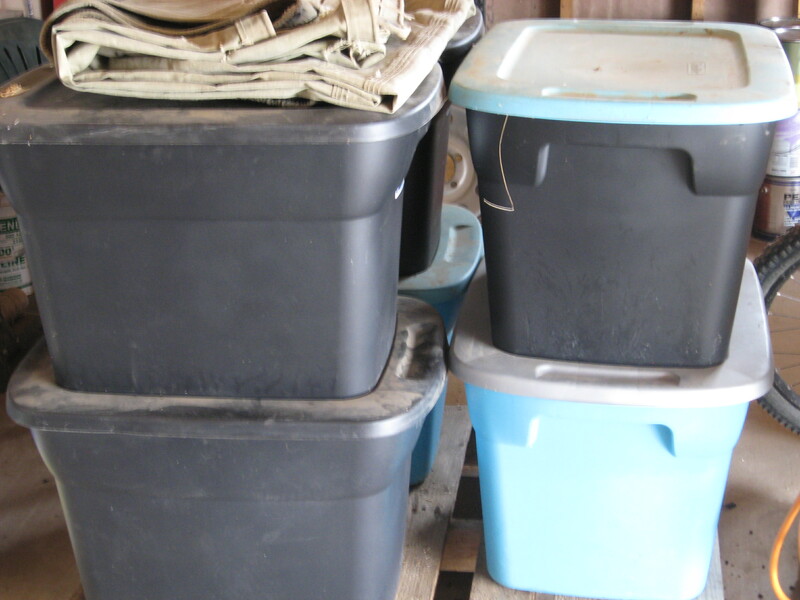 My intention was to put the pots in place on Friday and today and have them all covered over with the frost blanket, but this winter cold spell temporarily postponed that task until later next week. I want to put them out when the night low temps will stay in the 30’s for several days so that they can adjust more easily to being outdoors, even under frost blanket, in the cold. That way when the next really cold spell happens, and the temps go below 30 F, the plants will be more acclimated and shouldn’t have any trouble handling the cold with the help of the frost blanket. The fairy garden was put to bed today, along with the last things harvested from the outdoor food garden, I moved the remaining container plants into an unheated greenhouse space for the winter months. 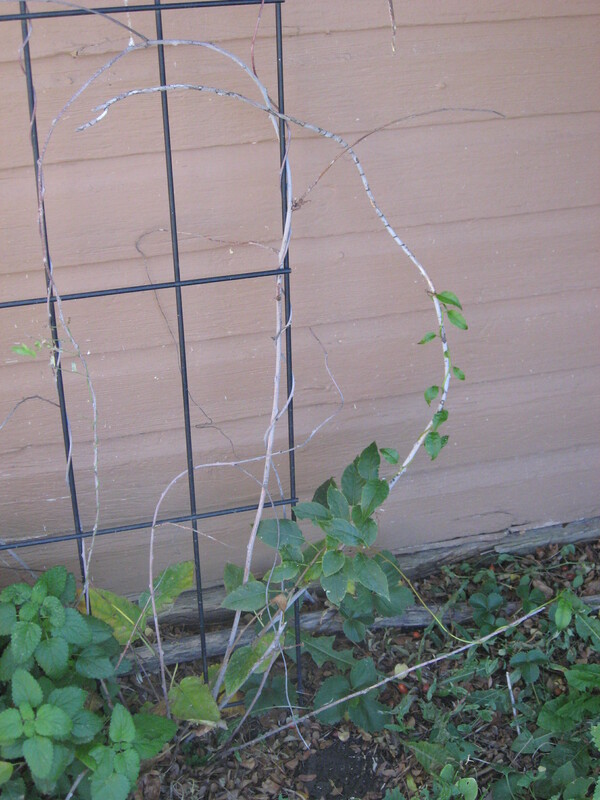 My hardy kiwi is still green and growing, and I think the cold will shock this plant into doing dormant for the rest of the year. 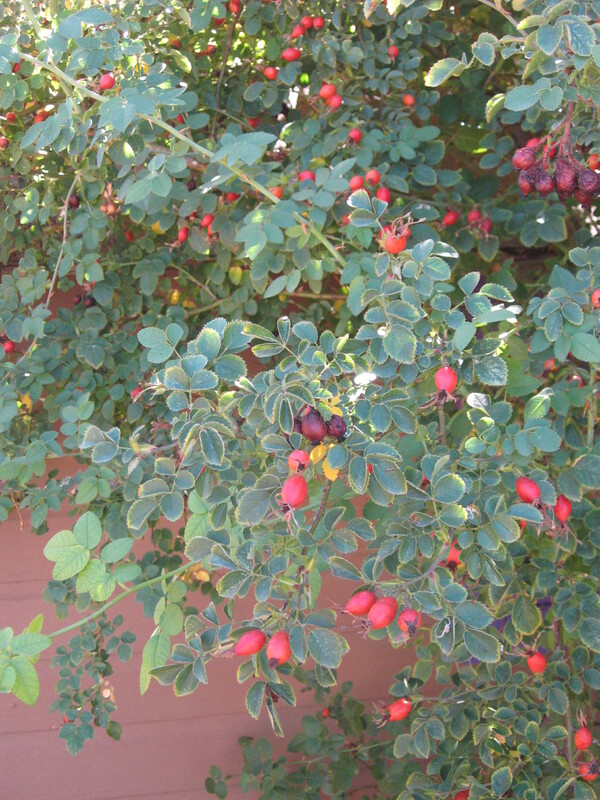 The Sweet Briar Rose is loaded with rosehips and after the hard frost they will be ready to harvest. 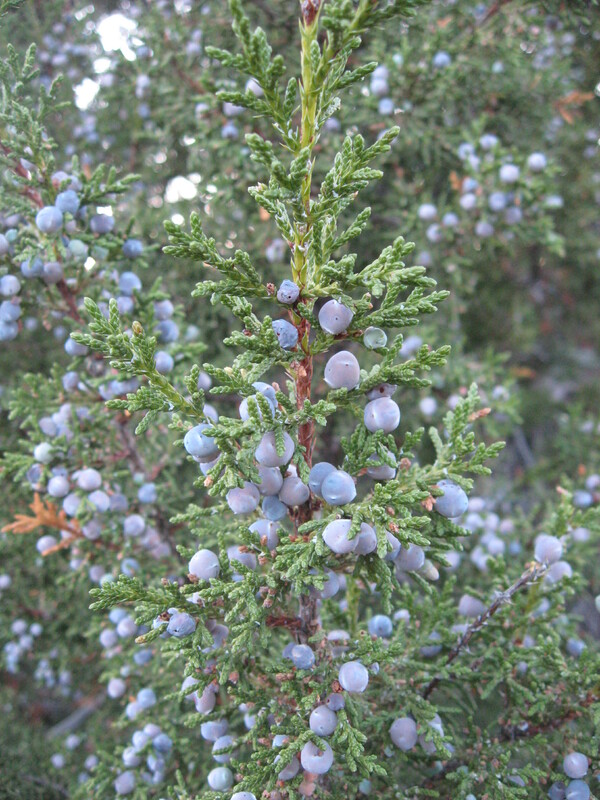 The same is true for the Juniper berries. The hard frost sets the vitamin C complex in these fruits so that it will be more stable. I’ll harvest both after this hard frost, dry or freeze them for later use both as herbal medicine and for cooking and tea. I managed to get 2 loads of laundry wash hung on the clothesline to dry before the rain and snow starts this evening. Chris split a supply of wood and stacked it on the back porch so we will have plenty at a hands touch for our wood stove, which is the primary way we heat our home. We are ready now I think for the first big cold snap of the year. All that will be needed is a pot of soup on the stove and hot beverages to drink. Yay! I suppose I’ll close this post and be back again next week with more happenings. Have a great weekend.